The role of Japanese forces in World War II has been receiving markedly more attention in recent years than was previously the case. Alan Bullock’s 1953 work Hitler: A Study in Tyranny, perhaps the first and most authoritative examination of WWII to emerge in the post-war years, fails to mention Japanese Prime Minister (and General) Hideki Tojo by name and contains only cursory mention of the theatre of war in the far east. In the early years of the 21st century however, from scholarly studies to documentaries to mini-series’ such as Steven Spielberg’s The Pacific, the Japanese contribution to the Axis war efforts and the many atrocities committed by Tojo’s forces have become the subject of renewed scrutiny. Continuing this trend, The World at War: Hitler to Hiroshima goes to admirable lengths to present a balanced and comprehensive account of hostilities throughout both Europe and the Pacific. This two-disc set comprises four episodes, simply titled European Theatre of Operations Parts 1 & 2, and Pacific Theatre of Operations Parts 1 & 2, with each of the four running just under an hour. The camera work is truly remarkable, containing stunning sequences of aerial battles over the village of Dunkirk, the first terrifying Luftwaffe raids of the Blitz, a fascinating look at the oft-glossed over war manoeuvres in the North African campaign, and, of course, a detailed examination of the war in the Pacific. Footage of Hitler’s blitzkrieg assault though France also goes some way towards capturing the inherent dread that must have been felt by all French citizens at the time, and on the Pacific side specific chapters explore such pivotal moments as the Battle for New Guinea, Pearl Harbour and Iwo Jiwa, the Atomic Bomb and the war’s end in Japan. 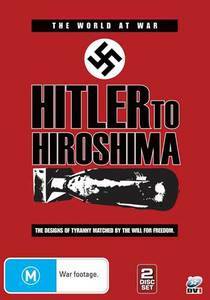 Despite some momentary lapses in pacing and snippets of over-simplified narration, Hitler to Hiroshima is a deeply moving series which effectively documents the horrifying drama of the Axis Powers tyrannical attempt to, as the documentary puts it, ‘enslave the world.’ Plenty here for specialists and armchair war buffs like myself alike, and an admirable attempt to encapsulate the pivotal moments of World War II in a way that is fresh and engaging to modern audiences. The impeccably-chosen and often quite rare period footage looks great considering its age, and the (thankfully) sparse modern inserts are clean and free of artefacts. The two-channel audio is perfectly fine, and as to be expected the aspect ratio is a 4:3 full screen. The real treat here is the period film; it’s really first rate, perfectly compliments the drama of the narration and, more importantly, much of it will be new to all but the most dedicated enthusiasts.